Seattle is one of the main cities in the history of rock music. The whole musical direction appeared here, it has a huge impact on the culture of the second half of 1980 and the first half of the 1990s. Of course, it is about grunge. Pearl Jam, Mudhoney, Soundgarden, Alice in Chains, Foo Fighters and, of course, Nirvana, – all these groups are from Seattle. So wear a plaid shirt, worn jeans, Converse sneakers and go to wander the streets that inspired Chris Cornell and Kurt Cobain. If you are planning to go traveling and want to know more about places to visit in Seattle, then we offer you this virtual tour, which will be helpful in choosing the most interesting must-see places. Surrounded by mountains, forests and water, Seattle can boast not only with stunning nature and mild climate, but also the infrastructure, great opportunities for entertainment and recreation. The city is the headquarters of such well-known companies as Microsoft, Amazon, Starbucks. Boeing is actively operates here. According to various ratings Seattle is one of the best cities in the US. 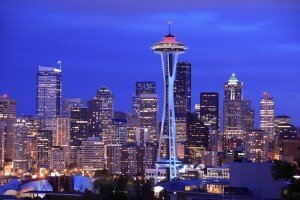 Place to visit number 6: Seattle Skyscrapers: Columbia Center, Space Needle, Smith Tower. The Museum is located on the territory of the Volunteers Park in the Capitol Hill area. It is a branch of the Seattle Art Museum and occupies building built in 1933 in Art Nouveau style (late version of Art Deco). This building was designed by Carl F. Gould from the famous architectural firm “Bebb and Gould,” and originally the main collection of the Art Museum was placed there. In 1991 it moved to the specially built building in the downtown. In 1994 Asian Art Museum was opened and ready to welcome guests. Among them there are the painting patterns, sculpture, pottery and textiles. In general, the museum has about 24 thousand of unique exhibits. In addition to the value, which its collection has, the museum can boast with a very advantageous location. Right next to it there is a greenhouse of the Volunteer Park, where you can see a wonderful collection of tropical plants, distributed over five rooms: bromeliads house Palm House, Fern House, House of seasonal collections and Cactus House. Entrance into the conservatory is free. As Asian Art Museum is not large, you will have enough time for looking at the greenhouse, and even sunbathing on the lawn – and leave the park by lunch time. It is worth noting that the Volunteer Park is one of the oldest in Seattle, and it is perfectly visible on the diameter of the tree trunks. Many rhododendron bushes here are more than hundred years. Interesting: Near the museum you will see a charming shop “Sam Shop”, where you can buy a lot of Asian goods and books about Asian culture and art. Each tourist can’t pass it by without buying some souvenir reminding of this nice place. In the heart of the city you can see the “metallic” brainchild of architect Frank Gehry. Some call it eccentric building area of ​​42,000 square meters mentioning its originality. This building is one of the most interesting museums in the state, which opened in 2000. The project is the history of music (EMP Museum). The idea of ​​creating a museum was of admirer of Jimi Hendrix – co-founder of Microsoft Corporations, Paul Allen. photos and videos of world musicians. By the way, in the museum, each visitor can record his/her own song, learn to play guitar, and even perform on stage in front of thousands of audience! 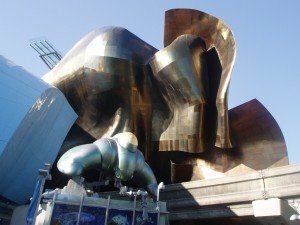 In 2004, Science Fiction Museum appeared, where you can listen to the story of spaceships, aliens and all that can’t be explained by the classical scientific explanation. In the Hall of Fame, founded in conjunction with the Museum of Science Fiction, you can learn all about the life and work of the great science fiction writers and filmmakers. Interesting: In total the museum has about 80,000 amazing exhibits. The market is the business card of the city and just market, which is annually visited by 10 million people! Every tourist who spends holidays here or comes on business in Seattle visits this place as one of the must- places to see. Moreover, it is the oldest market in the continent, which opened its doors in August 1907. 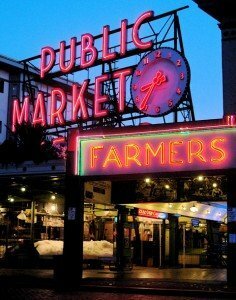 Pike Place is not just a market. all kinds of crafts and gifts. It is the most suitable place for buying the most original gifts. Pike Place is famous not only for shops and stalls. After all, this place can be called one of the main cultural centers of Seattle. Every day a lot of musicians and artists, jugglers and artists, charlatans and talents from all States gather here to demonstrate their skills or simply amuse the crowd. Interesting: After having seen and touched everything here, it will be a good idea to visit one of the market restaurants. Fortunately, they can boast with the first-class menu, fashionable chefs and, of course, only the freshest ingredients. Depressive-grunge, semi-abandoned Seattle and suddenly falls, cherry, neat bridges and other incredibly recognizable motifs of the rising sun … This is not a fantasy – it is a garden Kubota in the city of Seattle, one of the main attractions for tourists and, of course, one of the best places of recreation for the citizens. Amazing and beautiful garden Kubota was created by Japanese immigrant named Fudzitaro Kubota, who designed many other wonderful works of landscape gardening art in the United States. 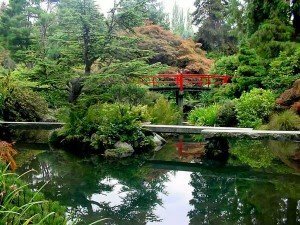 Fudzitaro Kubota arrived in the States in 1907, and a magnificent garden in Seattle was laid already in 1927. Certainly, in the process of creation the creator consciousness arose images of his native land. Actually, that’s why the garden has become so authentic. It is easy to guess that its name the garden inherited from the creator of the brilliant landscape design – by the way, who was self-taught. all sorts of exotic plants. And, most importantly, amazing atmosphere, which allows you to turn away from all the hustle and indulge in classic oriental contemplation … It is not surprising that this park is very popular. Therefore better to come here during the week, so as not to disturb the idyllic atmosphere of the oasis of peace and tranquility in a busy working day. Interesting: Kubota Garden is quite a large space, so visitors are given the map with all the most interesting places marked there. One of the most unappetizing, unhygienic but amazingly colorful sight of the world is in Seattle. And its name is Wall Gum. Needless to say that all dentists, conservative grandmothers and adherents of a healthy diet, don’t find it very attractive. 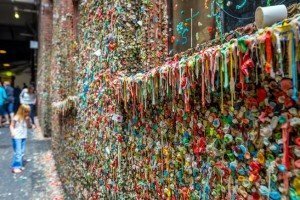 However, the fact remains – sealed thousands of chewed gums and turned into a dried unpleasant lump of gum wall is considered to be the official Seattle landmark, which makes it one of the must-see places! One cannot damage it as it is protected by the city. Of course, all those tourists who are not so scrupulous concerning their teeth and who take modern art in all its manifestations rush to the wall in order to stick their own chewing gum and, of course, make a “selfie” on its background. More than a dozen photos of celebrities can be found near this wall as well. It is necessary to say a few words about the history of the walls of the chewing gum. Despite the fact that this happened not so long time ago, about 1993, there is no one exact data of the wall appearance. Some argue that it appeared because it was forbidden to come to the performances in the theater chewing gums and as the wall is situated near it, such wall was created. The visitors had no choice but to throw them, or of the hazard, mold on the adjacent wall. Others claim that chewing gum appeared here due to the long queues at the box office of the theater, where people had nothing to do but to amuse in such a way. Others say that the wall of chewing gum – a art project of the theater company, which deliberately stick a lot of bright clumps on the part of the house. Interesting: The employees of the theater twice tried to wash the wall. But it appeared again, until in 1999 it was given the status of official sight. Columbia Center – one of the tallest buildings in the United States. And no wonder, because it has 76 floors. 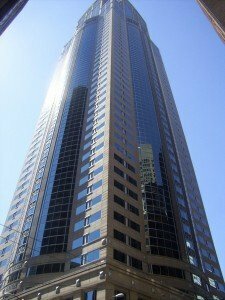 This skyscraper is renowned for its observation deck, located on the 73 level, which offers a stunning panorama of the city. Space Needle – the second famous highest skyscraper in Seattle, which is considered the symbol of the city. It attracts tourists with the unique restaurant Sky City, spinning slowly once in 42 minutes. In addition to the luxurious dinner you can enjoy breathtaking views of the night in Seattle, which will sparkle with millions of lights just for you and your companion. Smith Tower- it is inferior in height compared to Columbia Center and Space Needle: this 42-storey building occupies only the third place in the list of the Seattle skyscrapers. On the 35th floor of the building there is a traditional for the skyscraper observation deck, which allows enjoying beautiful views. Interesting: Smith Tower is remarkable by the fact it is the city’s oldest skyscraper, built in 1914. The museum The Wing Luke Museum of the Asian Pacific American Experience was founded by Wing Luke, who was the famous fighter against racial discrimination. The museum tells the story of Asian immigrants who have come a long way before they became real Americans. works of art of hardy Asians. 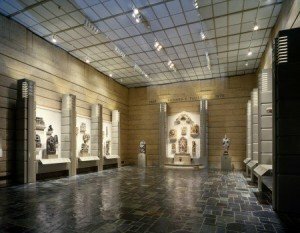 Interesting: In addition to the main exhibitions the museum presents specialized exhibitions dedicated, for example, to the Asia-Pacific cuisine, the famous Japanese family, who moved to America, or New Year’s traditions of Asia. 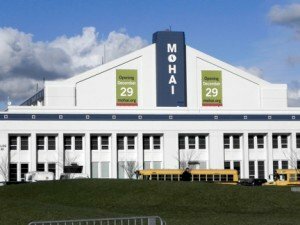 If you are interested in the historical events of Seattle since 1792 and things which inspired Americans in the 18th century, then don’t miss an opportunity to visit the Museum of History and Industry. Once in the hall “Brinkley”, visitors feel as they are transferred to the 80s of the 19th century. 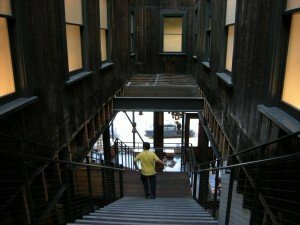 This gallery offers visitors a unique chance to stroll through the streets of the so-called “Boomtown” – Seattle during an active industrial development. Gallery “Klis” – a room with an amazing exhibition devoted to the Great Fire, engulfed Seattle in 1989. In addition, the Museum of History and Industry regularly hosts temporary exhibitions, such as the exposure of the fisheries of the 20th century. 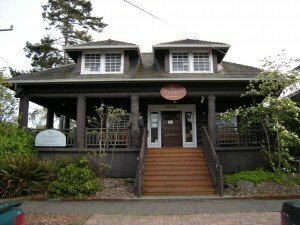 Miniature Log House Museum is located just one block from the famous beach Elki. It is dedicated to West Seattle. The treasures collected in this museum tell visitors about the identity and history of the region, not by chance the main exhibition has the name, which sounds like “Homeland – Seattle”. multimedia presentations of exhibitions about local settlers and aborigines Dyuvamish and Shukuamish. Every month special events for children and interest groups are held here. Interesting: In addition, there is a small souvenir shop, which working hours coincide with the museum. Each tourist who comes to see this place shouldn’t miss an opportunity to take some souvenir with him. 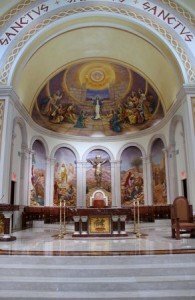 The monumental, majestic, grandiose, awe-inspiring – all these epithets are ideally suited for the description of the Catholic Cathedral of St. James, located in the heart of Seattle in expensive and elegant district First Hill. This temple can be called one of the “pearls” of religious architecture of Washington, it would perfectly fit somewhere on the main square of Florence or Paris, but it is the residents of the cosmopolitan and exciting Seattle who were lucky enough to live side by side to it. Moreover, two severe towers rising above the main building of the Cathedral of St. James can be seen from virtually anywhere in the city center. They inspire a sense of comfort and home warmth. Despite the fact that the US Church cannot boast with such a rich history full of events, as they are “brothers” in the Old World, the Cathedral has celebrated its centenary. St James Cathedral was built in 1907. At that time the diocese already had more than 50 years of its existence, grew and widened, because the construction of the Cathedral became just a necessity. Alas, either builders were careless, or the architect made mistakes in the draft, but after only 9 years, in 1916, the dome of the church collapsed due to heavy snowfall. Of course, the restoration work started immediately, but it was decided to change the original plan of the church a little bit. Next repair was in 1950, in the 80th barns and the house of the priest was rebuilt, so the initial project of the Cathedral of St. James differs greatly. That, of course, did not prevent the administration of Seattle make it one of the official historic landmarks. What you should pay attention to being inside the church? Stained glass windows made by the contemporary artist from Germany Hans Gottfried von Stockhausen, which appeared in 1994. If you like ancient relics, then here you will find the altar of the Madonna by the artist Neri di Beachy from Florence, it is already more than five centuries old. Finally, it is impossible to pass by the bronze doors with biblical scenes, which were made by a talented artist Ulrich Henn. Pilgrims usually dream of seeing the holy relics of Francis Xavier Cabrini. To get a complete and magical experience from the Cathedral of St. James, it is worth going to an organ concert. Interesting: The temple has two organs: the old firm “Boston”, which delights the ear of parishioners since 1907, and a relatively modern one, set there since 1994. The second, called “Millennium”, was designed by the famous organ master Manuel Rosales.